As a helicopter operator, you’re focused on getting maximum productivity and mission effectiveness from your equipment and personnel while achieving the highest levels of safety. To meet the challenge in today’s operating environment, you need smart technology that shares this same focus. And that’s what our GFC 600H flight control system is all about. Its advanced digital automation features include a stability augmentation system (SAS), hover assist, H-ESP technology, automatic LVL mode, Flight Director (FD) command cues and more. Plus, cyclic-mounted controls allow easy engagement of the flight control system and its primary functions without taking a hand off the controls or going “eyes-down” in the cockpit. You can count on GFC 600H to give you a more stable flight platform that serves to significantly reduce inflight workload, fatigue and stress levels — allowing pilots to focus more attention on accomplishing the missions at hand. As a top-level feature, GFC 600H includes stability augmentation inputs to help stabilize the helicopter. The subtle corrections provided by SAS serve to improve the helicopter’s basic handling characteristics by maintaining a commanded attitude. In addition, when the system detects that you’re hovering, the innovative hover assist feature will automatically provide flight control inputs to help maintain that position over the ground. It will also hold heading in hover when equipped with the available yaw axis control. Any pilot who’s spent time flying helicopters knows how demanding these operations can be, particularly when faced with complicated missions in adverse weather conditions or complex environments. The GFC 600H flight control system provides pilots a variety of advanced capabilities to help accomplish the multitude of missions they face. The attitude hold (ATT) mode, activated via the mode controller or force trim release button on the cyclic, requires no pilot input on the controls to maintain the commanded pitch, roll or heading; however, while activated, the pilot can easily “fly through” the flight control inputs for smooth hand-flown maneuvers. For hand-flying, the FD mode provides pitch and roll cues on a compatible flight display such as our G500H and G500H TXi products. Pilots can then use these cues to control the aircraft, following the indicated pitch and roll guidance to maintain a flight path defined by the selected heading, navigation, altitude and airspeed parameters. In Coupled (CPL) mode, GFC 600H provides the necessary control inputs to achieve the desired flight path. For maneuvers such as search and rescue patterns or visual approaches, the system can use guidance from a compatible WAAS-enabled navigation source — such as our GTN™ 750 or GTN 650 series of touchscreen avionics — to automatically fly the helicopter along a desired lateral and vertical flight path. Vertical modes include altitude hold, altitude select, vertical speed, indicated airspeed and glidepath/glideslope. Lateral modes include heading select, navigation and approach. GFC 600H includes a force trim release on the cyclic, allowing the pilot to reset the pitch and roll reference simply by flying the aircraft to the desired attitude and then releasing the force trim button. Once released, GFC 600H continues to hold the attitude you’ve selected. In addition, the system’s “beep trim” capability allows you to make pitch and roll input commands to the system directly from the cyclic-mounted controls. You can also beep trim vertical flight director references such as IAS, vertical speed and altitude. As a standard feature, Garmin H-ESP helps the pilot remain within a safe envelope when hand-flying the helicopter. Should the pilot exceed pre-determined pitch, roll or airspeed limitations, H-ESP provides a corrective force on the flight controls proportionate to the exceedance. H-ESP functions independently of the system — although it uses the same control servos — to assist in maintaining a safe, stable flight condition whether the system is engaged or not. As needed, H-ESP can be manually disabled to allow for tactical maneuvers. To further enhance safety in potentially disorienting situations, a dedicated LVL mode can be engaged by the pilot to automatically initiate recovery from unusual attitudes and return the aircraft to straight-and-level flight. The GFC 600H flight control system’s control capabilities also encompass overspeed and low speed protection. In an overly high airspeed situation, for example, overspeed protection will engage and apply back-pressure to the controls to increase pitch attitude, thus preventing the aircraft from exceeding airspeed limits. Conversely, if airspeed becomes too low while in altitude hold or vertical speed modes, low speed protection provides control inputs to maintain safe speeds for the selected mode. With its extensive features and advanced technology, GFC 600H offers unprecedented value in a flight control solution for helicopters. Backed by a comprehensive warranty and the industry’s No. 1-rated product support team, it’s truly a system you can own and fly with confidence. Supplemental type certification (STC) for GFC 600H on the AS350 B2/B3 is expected to be completed later this year. 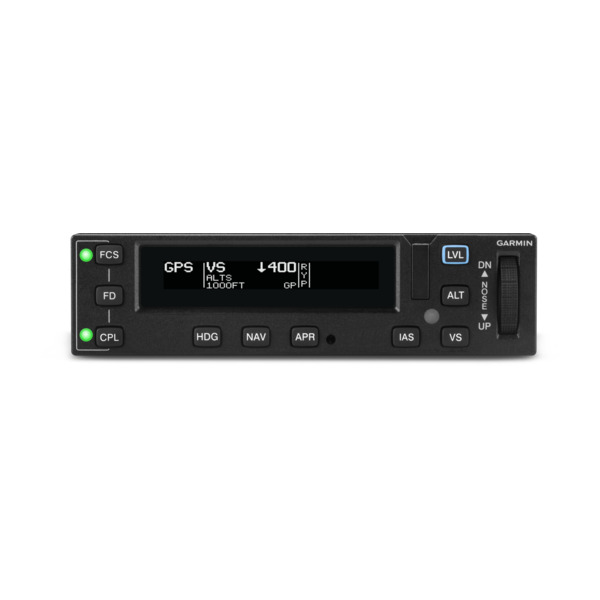 See your authorized Garmin installation center for more details on configuring a GFC 600H flight control package for your helicopter.